14188 Cross Trails Drive Chesterfield, MO. 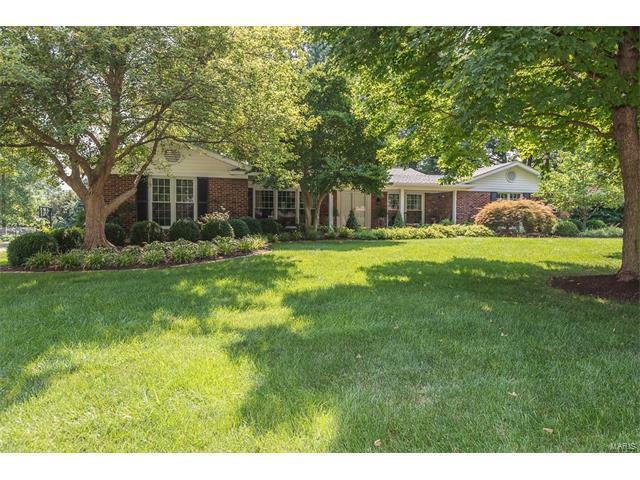 | MLS# 17058130 | Real Estate in Saint Charles and Saint Louis Areas, including Saint Charles, Saint Peters, Weldon Spring, O' Fallon, Wentzville, Dardenne Prairie, Creve Coeur, Chesterfield, Florissant, Hazelwood, Kirkwood, Des Peres, Saint Louis City, Homes for sale. This is a one of a kind brick ranch beautiful in & out w/wood floors thru-out, lg formal LR & DR; vaulted great rm w/gas frplc; totally updated custom designed kit; lg center island; brkfst bar; granite counters; w-in pantry, many cabinets; & stainless appliances. All BRs are large & spacious & bathrms have been totally updated! If you need more living space or just want to do even more entertaining check out the fin LL w/2nd fam rm,rec rm, office/den, or poss additnl bdrm. You still have a lg storage rm/util rm & sink, & built-in shelving in the unfin part of the LL. 2-car rear entry gar w/opener & gorgeous landscaping front & back makes you feel like you are in a park. Updates & amenities incl some crown molding, vinyl thermal tilt-in windows, updated kit & baths, inground sprinkler system, nwr roof, new asphalt drive, nwr furn & c-air. California closets, French doors, six panel doors, aggregate patio & walkways, & huge covered front porch. This house is like living in paradise!